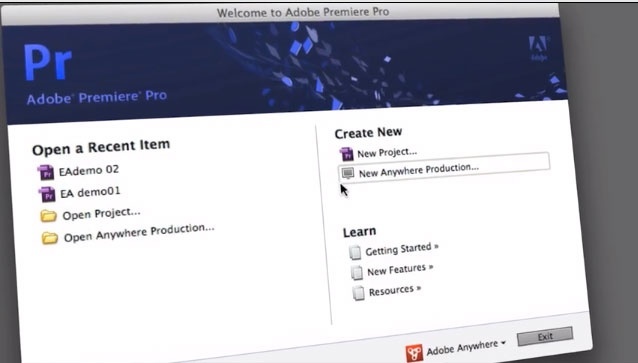 The CNN precedence introduction example of "Adobe Anywhere for video" in which Adobe made a formal announcement in 2013 NAB Show "Adobe Anywhere: Collaborate without Boundaries" was exhibited. If shipment is started in spring and the image work tool of the latest version of Adobe Systems, such as Adobe Premiere Pro of the latest version, is required for this Adobe Anywhere for video, explanation is given in Press Releases. It is clear from this thing that the next term Adobe Premiere Pro is used in CNN, Unlike the purplish red of present Adobe Premiere Pro CS6, the project file screen of Adobe Premiere Pro which appears in a case animation can check having a blue color of Photoshop CS6 tone. Moreover, having been written as the former "Adobe Premiere Pro CS6" has changed to the notation of "Adobe Premiere Pro." From this thing, it is predicted that Adobe stops the notation next Adobe Creative Suite to "CS7."